Edit: 1/1/17 I’ve made some changes after my second viewing of the movie. I’ve been a fan (read: obsessed) of Star Wars my whole life, so I wanted to share my thoughts on The Last Jedi. Growing up I’ve seen the Original Trilogy and Prequel movies literally hundreds of times, read dozens of books, and played many of the video games (I swear it’s not a problem). I am also one of the many mourners of the old expanded universe (Disney made the stories in all the books, comics, and other material not canon when they acquired the franchise). I’m going to start with a spoiler free section if you want to know my thought’s before you see the movie, go there. After that everything will have spoilers. That’ll be followed up by a breakdown of my thought’s as the movie progresses (it’s going to be a bit nit picky, so I may sound more negative than I mean). After that I’m going to respond to common critiques of the film. Finally, there will be a wrap up talking about where the franchise is now and what I’d like to see in the future. The Last Jedi is a great movie! It decently adapts the “feeling” of the original trilogy, without outright copying it (stares at The Force Awakens). It does have it’s rough spots and feels long, but the good parts easily outshine the rough ones. I highly recommend it for any Star Wars fan who can get past losing the old expanded universe as well as anyone interested in seeing a good movie. The opening with Poe and and Rose’s sister (Paige) is solid. We get to see more of his humor and his leadership style (which is important for his development). Without ever saying a word, we get to see the strength and sacrifice of Paige’s character. That is done excellently. The scene does have one of my main problems with this movie (and the Force Awakens for that matter). Almost everything has to be funny. When Poe pretends to not hear Hux, it’s funny, but it really makes Hux look weak. Hux being incompetent would be fine, except he’s a high ranking general of the First Order’s military. He should be intimidating. This by itself would be acceptable, but this issue is compounded through the movie. The next scene I wanted to talk about was when Leia is blasted into space. I’m glad Kylo wasn’t the one to do it. I think it makes sense for his character. I just don’t like the way they did it. I’m glad she lived, I thought Carrier Fisher did a good job with her through the film. But I think all of us knew it was going to happen, and would have been fine with her death. For someone who doesn’t seem to use the force much (aside from feeling loved ones die), having her survive that seemed too far-fetched. I think a better scene would have been her trying to force pull others towards the door (and probably fail). It’s more believable and shows her commitment to her allies. I do want to clarify, I am very happy we got to see some force action from her. That was one of the things I was hoping they wouldn’t completely remove when they dumped the old expanded universe. On to Luke and Rey meeting. Luke had been through a lot, but I feel he’s just a little too gruff. Though it is believable given what he has gone through. That being said, this version of the character is portrayed well and I think it’s an OK balance of funny and serious. Oh and I have to say R2 using Leia’s old recording to convince Luke to help Rey was great. Rey’s natural ability with the force caught me off guard at first (as it did in Force Awakens). The argument I like is that unlike Luke, she fully believes in the Force and it’s powers. In Empire Strikes Back, Luke fails to lift his X-Wing because he believes it’s too heavy. His mind was creating the limitation. Rey has no such limitation. She has grown up listening to the stories of the famous Luke Skywalker and his abilities. Realizing that she could have her place in that story, she fully embraces the force. This leads to one of my favorite new (movie) Force powers! Rey and Kylo communicating really reminded me of Han and Leia’s kids from the old expanded universe (Jaina and Jacen) and I think the scenes were well done. Now for the lowest part of the movie. Rose, Finn, and Poe’s plan is very classic Star Wars (reminded me a bit of Han actually). I did find it a little strange that Poe and Maz knew each other, but he didn’t check up on her after the battle that destroyed her cantina in the Force Awakens. I also found her fighting during the holo-call was a little distracting (if they wanted her to do something cool, that’s find, just less distracting would have been appreciated). The gambling planet just doesn’t work. 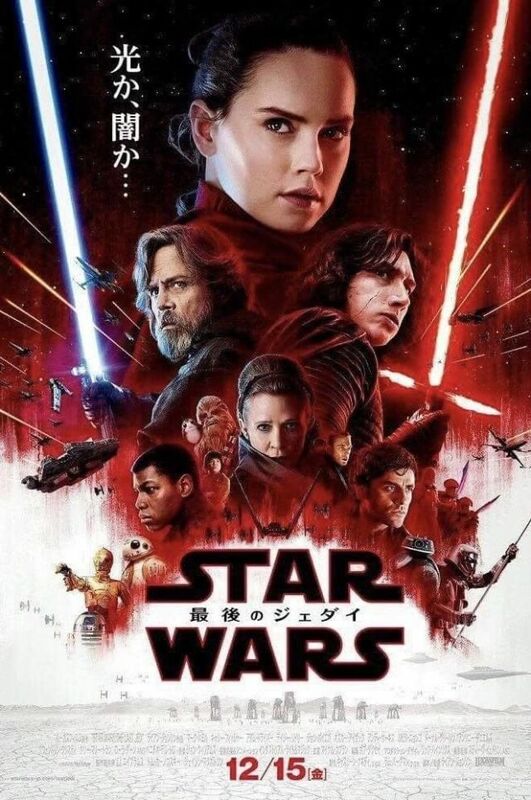 Yes it has new Aliens and tries to add a bit of moral ambiguity (rich traders being fine with the First Order and how they sell to both sides). However it fails at adding shades of gray, feels too silly, has an in your face moral (animal cruelty is bad), and it has very little plot impact. By finding a highly competent slicer who wasn’t the one they were after it shows that Rose and Finn could have gone to many other places, some which might not be aligned with their enemies (and where the slicer doesn’t turn on them, though I don’t mind that at least). In addition, after the slicer tries to make Finn doubt the goodness of the Resistance, nothing changes. Finn has no internal strife, doesn’t back talk Leia, he just tries to sacrifice himself for the survival of the Resistance (more on that later). Throughout all the scenes on Canto Bight, I just wanted to go back to Rey and Luke. Side note: The mainline Star Wars movies have never been good at moral ambiguity. Think about the opening of A New Hope. All you need to know (and all it tells you) is that the Empire is big and bad and the Rebellion is the good under dog. The Sith do bad things, why, because they’re evil. Though I would love for more shades of gray (which various books and video games have explored well), the mainline movies can’t because they rely too much on the simple good vs evil plot. I hope the off shoot movies can do a better job at this in the future (Rogue One didn’t in my opinion). Back on the island (the planets name is Ahch-To), Rey ends up causing some destruction. This is where we get introduced to the islander caretakers. I understand that it’s unlikely the ruins would have survived without someone repairing them, but these aren’t normal ruins, they’re Jedi ruins. I feel like the force would have protected them pretty well (not to mention Luke could have rebuilt things while he was there). So the real reason the caretakers exist is to provide a few gags. This would be alright if it didn’t lessen the impact of Luke’s isolation. So I wish they weren’t there. I also wanted to say I was happy to see Rey struggle with the temptation of the dark side. I’m a little torn about her asking about her parents. On one hand it feels pandering to the audience and the theories people have been cooking up. On the other she is thrust into being around some of the most well known and famous people in the galaxy. She’s a nobody, who’s hoping that she secretly was always destined for greatness. Now onto the Yoda scene. I definitely enjoyed it. I felt they should have just made him look like the original trilogy puppet instead of a new one, but his humor and insight was appreciated (and hey, Yoda using lightning was cool). I feel like it should have been Obi-Wan though. Luke was closest to him, and they have the shared connection of losing an apprentice to the dark side. My guess is they didn’t do it because they didn’t want to make a CG Alec Guinness (the original trilogy Obi-Wan actor). Though thematically it would have been much more appropriate. Back with the Resistance Poe starts a mutiny. I’m not against him rebelling against General Holdo (who is very cool by the way). But I do have the problem that all of that could have been avoided with better communication. In addition, the moral that Poe needs to be less wild and risky is a bit too heavy handed. It ended up feeling kind of preachy and annoying. Side note: I have a personal pet peeve in stories where problems could have been avoided if character’s just had a conversation about something. If it makes sense for the characters (socially awkward, paranoid, etc) then that’s fine. But two high ranking military officers should know how to ask a few questions or be able to recognize the need to explain a plan. I enjoyed how Kylo killed Snoke, and the ensuing battle with Rey was very cool. I was actually hoping she would unite with Kylo to save her friends (her falling to the dark side would have brought a very different meaning to the name “Last Jedi” and created a cool conflict later). It was a little sad to see Anakin’s lightsaber destroyed, but I liked the symbolism of the last parts of the old order (good and bad) being blown away. Holdo sacrificing herself created a beautiful moment, both emotionally and cinematically. I would totally buy artwork of the hyper space trail slicing through the ships (though I’m ignoring the fact that that killed thousands of people). Finn and Phasma was an interesting fight. I think it would have been more impactful if they had a better rivalry developed in the last movie. My bigger problem though is that it felt like Phasma was supposed to be this trilogies Boba Fett, but she just seems to lack something. The best word I can think of is agency, but that’s not quite right either. Fett doesn’t say a whole lot, and doesn’t do a lot, but he seemed to have weight in each of his scenes (talking back to Darth Vader for instance). Phasma is seen either reporting to people or talking down to subordinates. Though it does makes sense for her station, I felt like she could have been used so much better (have her be a leader of a Darth Vader cult or force sensitive, just something). Repeating a problem I had early, right after the emotional moment of Phasma falling to her death, BB-8 has a gag where he takes control of a walker and starts blasting people. It just feels inappropriate and doesn’t let the feeling stay. BB-8 is especially guilty of this throughout the movie (bashing his head into the X-Wing console to get it working or surviving the hanger blast that kills a lot of pilots). It’s frustrating that the film for the most part can’t handle making the audience feel upset for too long. Speaking of BB-8, in The Force Awakens I felt he was puppy like and lovable. Now he has an actual kill count, that kinda hurts his cuteness factor for me. Down on the salt planet of Crait, I loved the homage to the Hoth battle in Empire Strikes Back. It has resemblance while adding it’s own flair. I do feel like Finn trying to sacrifice himself would have worked better if his speeder was farther away from the cannon and more likely to fail. Also Rose’s not death was weird. I get they wanted a dramatic scene, but I wasn’t sure if she just died or passed out or what not. Luke walking into the base felt very cool. I’m glad he was able to talk to Leia before he died. Giving her the dice was weird though. Yes it was in the Millennium Falcon in A New Hope (not in Empire Strikes Back or Return of the Jedi), but they are hard to spot and have no story relevance. So it just feels kind of meaningless (not to mention if they were valuable, why did Leia leave it behind). My guess is that they will play more of a role in the upcoming Han Solo film, but we shall see. I think it makes sense for Kylo and Hux to argue a little. After all they both did before Kylo became the new Supreme Leader. The extent to which Hux has no back bone feels wrong though (for the reasons I mentioned earlier). Luke not feeling Kylo is redeemable is odd to me. One of the points of Return of the Jedi is he disagrees with the old masters on Darth Vader’s redeemability. It’s strange that even after saving his father, he sees no hope with Kylo. Edit: On my rewatch I realized Luke mean he could not save Kylo, not that Kylo was un-redeemable. The fight with Luke was cool and his death scene was done well. One of the few moments the movie just lets you feel without throwing some humor in. The hand-off between Leia and Poe was done really nicely and felt pretty good. Finally, the before credit scene (because it is very much so in the style of after the credits scene, just you know, before them) with the little kid using the force broom felt a bit forced (pun not intended), pandering to kids, and just felt out of place as the closing. I wanted to list a few common problems people have had with the movie and my responses towards them. In the 40 years of Star Wars, we’ve had an overload of information about everything, from rehashes of each move to stories about unimportant background charters. The movies were something that had been well explained and dissected via other books and comics. So, many fans are uneasy now when we don’t know everything. But the original movies were just like this though. For example, how much information did we know about the Rebels and the Empire from just the first movie? Well the opening crawl tells us the Empire is bad and evil, and the Rebellion is the good underdog. We don’t need to know how the Empire came to power or who the Emperor is to be able to enjoy the movie. Now that we don’t really know who Rey’s parents are or how Phasma escaped the trash compactor is fine as long as it doesn’t detract from the movies plot. (Not to mention if you just wait a few years everything will be explained indepth again anyway). Through the cries of “You killed my childhood!” I sigh. The old movies are still there. You can still get all the old expanded universe novels and games (branded legacy now by the way). The cannon has changed (and yes I’m still upset about it too), but if this was the original expanded universe and the new movies were old expanded universe stories, you’d be upset in the same way. Luke is flawed. His mistakes literally wipe out the Jedi, brought a new empire to power, and gets one of his best friends killed. If he was the same bright eyed hopeful youth as A New Hope it’d feel wrong. I believe it is necessary for the saga to continue without him (though I do expect an appearance or two as a force ghost). Otherwise Star Wars won’t be able to grow and explore new stories and themes. I want to be clear on this. Most of the humor in the movies is funny and enjoyable. In fact, the old movies also had their own fair share jokes (even in serious moments as seen above). But there is a difference in how those jokes were delivered between the original trilogy and the sequels. Han makes this comment and moves on. It’s natural for his character to do it, but the movie doesn’t dwell on it. In the sequels, these moments are often more gag-y and are timed to feel like they have a laugh track. In most cases it detracts from the tone of the situation and I find that frustrating. This is the middle movie of a trilogy. It’s hard for a movie to follow up something good, and set up something meaningful, while also making itself worth it. That’s not an excuse, look at Empire Strikes Back. What I want to say though, is that fans will have a different view of The Last Jedi once Episode IX comes out. It could be better or worse, but I have a feeling most of the common complaints will lessen once we know how this trilogies concludes. I really want to see Rey struggle more with the dark side. She hasn’t had a whole lot of time being trained (granted Luke didn’t either), so it could make sense she would have trouble. Though I don’t have any specific ideas for how they will kill Leia, I just want it to be a worthy send off for her. I expect Kylo and Hux will continue having issues. Maybe to the point that Hux leads a mutiny of Kylo. After which Kylo would hesitantly work with Rey for his revenge. This could either lead to him being redeemed and help Rey rebuild the Jedi in a better way, or him fading from the spotlight as he is unable to reconcile the light and dark within him. The mainline Star Wars movies have always followed a Skywalker, so I am curious to see if that will change or remain the same as they continue. Overall, The Last Jedi was a great film. It had the right amount of fan service without going to far. It was very well acted, with a good over arching plot (with a couple rough spots). The humor is funny, though often at odds with the tone. It felt a bit too long (with way more climaxes than necessary), but used it’s time well to develop it’s characters. Most importantly though, it did a good job of capturing the feel of the original trilogy while making something new.